Improvements have been completed at the S.R. 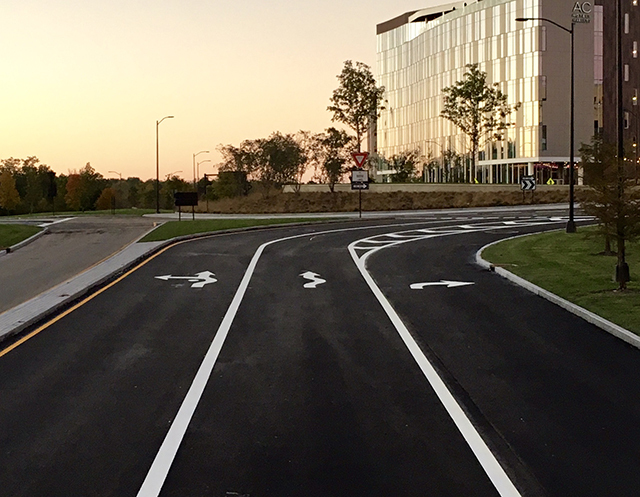 161/Riverside Drive roundabout, and the intersection is now open. Please be aware that the northbound lane assignments have changed to better accommodate driver behavior and traffic patterns. The City of Dublin is happy to report the improvements were completed ahead of schedule. We thank drivers for their patience. Dublin’s Engineering Division and Police Department have been closely monitoring the S.R. 161/Riverside Drive roundabout since it opened in August 2016. After months of evaluation, staff concluded that driver behavior and patterns have been different than predicted, particularly in the northbound direction. The new lane configuration on northbound Riverside Drive will better distribute traffic flow. Along with the lane assignment changes, there are also improved pavement markings and signage in all four directions. Drivers are reminded to slow down and yield to all lanes of traffic before entering the roundabout. The City will communicate all traffic impacts and updates at DublinOhioUSA.gov/construction. Please sign up for eNews and follow the City on Facebook, Nextdoor and Twitter to ensure you are informed.